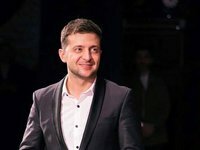 Volodymyr Zelensky, a presidential candidate of Ukraine, believes that in order to resolve the conflict in Donbas and restore Ukraine's territorial integrity, it is necessary to win an informational "war" and work to make the population in the occupied territories feel part of Ukraine. "We need to start a serious information war and win it. I talked about this with my American colleagues, and they supported such an initiative. People, who live in the occupied territory of Donetsk and Luhansk regions, should return to understanding that they are Ukrainians," he said in the "Interview with the Presidential Candidate" program on ICTV. Zelensky suggests making a powerful Russian-language channel that would be international, that would broadcast to the territory of Crimea, Donetsk and Luhansk, to the territory of Europe, the U.S. and Israel, and would show "real news and real life in Ukraine in the right way." "We should tell them [residents of the occupied territories] that they have been deceived by conducting an information war that they are being deprived of the Russian language. We do understand that the language was not the reason for the escalation of Russian aggression. We should tell them that the only thing they were hooked on is that allegedly there is an intention to take away this Russian language. I would do it purposefully," he noted. Zelensky believes that Ukraine should pay pensions to those living in these territories. "It is clear that they come to the territory of Ukraine, get it and leave. But most of the people there are deprived of it. I would return it. Experts say that this can be a big loss for the budget of our country, but that is also our country. If we say that Luhansk and Donetsk are our country, then we must do it," he explained. In his opinion, Ukraine should send a signal to the inhabitants of the occupied territories of Donbas and Crimea that "we remember you, you are ours, you are entrapped, but we are one country, and we will definitely return." Zelensky believes that the proper development of the Ukrainian economy and the demonstration of this will create "a wave that will start from Donetsk and Luhansk and even pass into Russia." "When these people begin to doubt, they themselves will help us very much to return these territories," he said. At the same time, the presidential candidate of Ukraine believes that the annexed Crimea can be returned to Ukraine, when "there is a change of authorities in Russia."